The Holocaust is the systematic mass murder of European Jewry and others by the Nazis. The term Holocaust literally means a fire that causes total destruction. Yehuda Bauer, one of the world’s most eminent historians of the Holocaust, differentiates between the term genocide and Holocaust by defining the term genocide as partial murder. While there have been numerous instances of genocide, the total annihilation of a people was never an officially sanctioned purpose of a national government as it was in Nazi Germany. It is precisely this which differentiates the Nazi action against the Jews from other genocidal attempts against a people. The Nazis wished to conquer the world and therefore threatened the very existence of every single Jew in the world. The principle target of the Nazis was always the Jews. Yes, it is true that as many as 50 million human beings were murdered by the Nazis and their collaborators. The Nazis destroyed the lives of Gypsies, homosexuals, the mentally disabled, Jehovah’s Witnesses, communists, socialists, trade unionists and religious opponents. But it was only the Jews who were singled out for the Final Solution. On Nov. 9 1938, mobs burned synagogues, destroyed Jewish homes and businesses, vandalized Jewish hospitals, orphanages and cemeteries, and dragged thousands of Jewish men, women and children into the streets, where they were beaten and humiliated. The Germans later called this night “Kristallnacht” — The Night of Broken Glass —- because of the tons of shattered glass that scattered throughout German cities, after it had taken place. The Jews began to call that date the beginning of the Holocaust because of the tremendous violence, which started on that night and grew even more dreadful as time had passed. On Nov. 7, 1938, the Third Secretary of the German embassy in Paris, Ernst Von Rath, was murdered by Herschel Grynzpan, a 17-year-old German-Jewish refugee. Herschel wanted to avenge his parent’s expulsion, together with 15,000 other Polish Jews from Germany to Zbonszym. The Nazis used the murder as an excuse to start the mobs and riots that began the “final solution,” the extermination of Jews. The German government attempted to disguise the violence of those two days as a spontaneous protest on the part of the Aryan population. But in reality, Kristallnacht was organized by the Nazi chiefs and their thugs with technical skill and precision. The Nazi chiefs commanded the Gestapo and the storm troopers to incite mob riots throughout Germany and Austria. 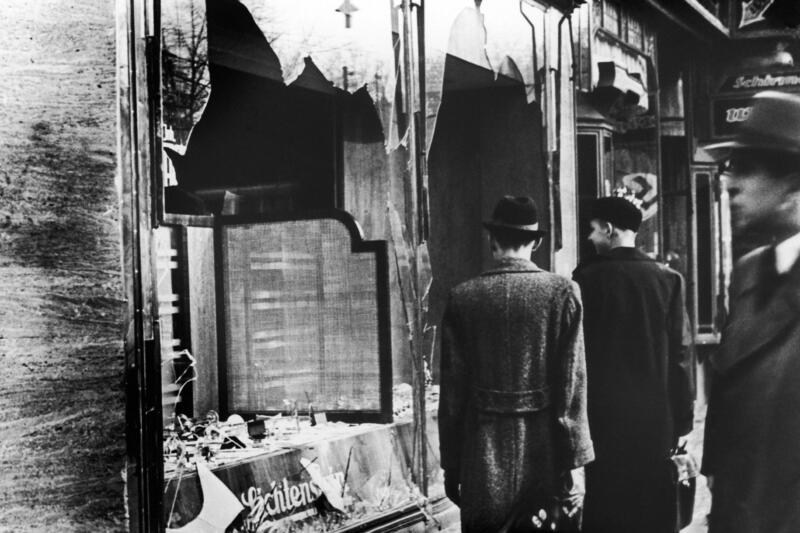 Kristallnacht marked the beginning of the plan to rob the Jews of their possessions for the benefit of the Reich and then to sweep them forever from the German scene. Thereafter, Jews had no place in the German economy, and no independent Jewish life was possible, with the dismissal of cultural and communal bodes and the banning of the Jewish press. Today, many historians can trace a pattern of events before that night that suggest such an atrocity was to happen. In 1933, when the Nazis took power, German anti-Semitism adopted quasi-legal forms. One of the new anti-Jewish forms of action, which had began with the Nuremberg laws of 1935, included the separation of the Jews from the daily structure of German life. Jews systematically were deprived of civil rights and isolated from the general populace through humiliating identification measures. Nazis boycotted Jewish shops and took away their jobs. Jews were declared the value of their possessions. Civil Service and police often arrested and forced them to sell their property for a pittance. How could the entire world stand by and allow such a disaster to occur? The fascist or authoritative regimes in Italy, Romania, Hungary and Poland were governments who approved of this pogrom and wanted to use the pogrom as a case to make their own anti-Semitic policies stronger in their individual countries. The three great Western powers — Great Britain, France and the United States — said the appropriate things but did nothing to save the Jews. In the late 1930s, Hitler told the world to take the Jews, but there was just no one willing. Even in our own country, President Roosevelt and his administration kept on expressing their shock over the terrible events in Germany and Austria, but when it came time to act and help save the refugees by bringing them to the United States, the government refused and replied by saying that they have no intention to allow more immigrants to enter. Looking back at Jewish history, every Jew should be cautions and alert to any hints that might be seen now. Kristallnacht teaches us many things. Among them that we must remain vigilant and not permit even the smallest seed of anti-Semitism to take root . Rabbi Bernhard Rosenberg is chairman of the New York Board of Rabbis Holocaust Education Committee and the author of several books, including “The Holocaust as Seen through Film” and “The Holocaust Haggadah.” Visit www.bernhardrosenberg.com.